Q: With fewer gas stations offering free air, it has become a challenge to keep tires properly inflated. 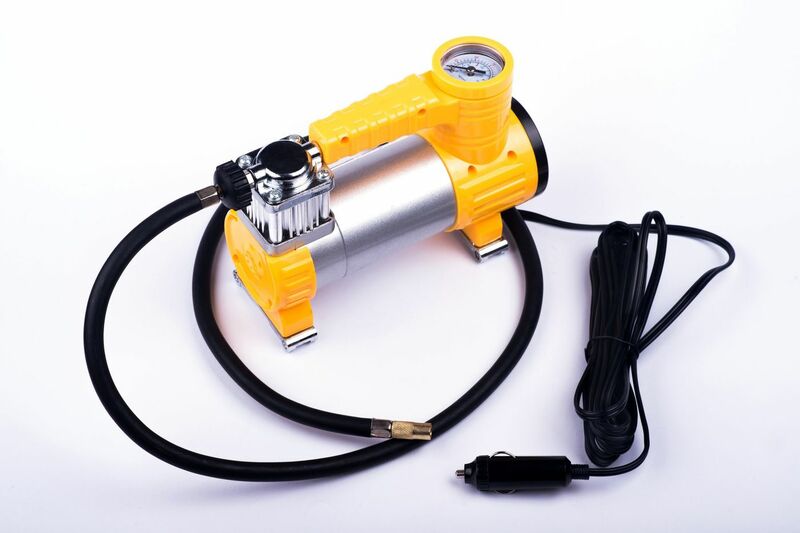 One solution is a handheld, cordless, rechargeable air compressor, advertised as inflating tires and toys easily and quickly. Have you had any experience or feedback on these products? A: Yes, I have. As a matter of fact, I keep one in each of my vehicles, except the Harley. Many newer cars come standard with an inflator that you plug into the power outlet (formerly known as the cigarette lighter socket). Along with the inflator is a can of puncture sealer. This duo replaces the spare tire which took up space and added weight. You can find them in auto parts stores and I would suggest getting one to keep on hand. Q: Over the weekend the low tire pressure light came on. I took it to a local tire shop to have air put in the tires and the tech asked if I’ve ever considered getting nitrous in my tires instead. He said it’s better for the tires in the winter because it bleeds less and will improve the fuel economy. The cost is low (only $20 for all 4 tires), but would I need to have another procedure done in the summer to have the air put back in my tires or could I drive all year? Is this something you would recommend or is this just an up-sell? A: Because the air we breathe is almost 80 percent nitrogen, spending $20 for more seems unnecessary to me. But if you choose to replace the air with nitrogen (not nitrous), you can leave it in all year. But be cautioned that should your tires need some future inflation, you should probably seek out a shop that offers nitrogen because it is not available at your local 7-Eleven. Q: I have 2005 Ford Five Hundred with about 200,000 miles. Recently, the check engine light came on, so I took it in. After running diagnostics, the mechanic told me that it’s an old code indicating problems with the throttle, but there’s nothing wrong with my throttle. The car runs great. The mechanic told me that he could replace the throttle, but it’s not necessary. He turned the light off and I went on my merry way. The light has come back on; the car is still running the same. Any ideas? A: Because the car is running well, I suspect that the engine control system is getting some bad information. The system relies on inputs from numerous sensors and the accelerator pedal sensor is one. But I am not ruling out something else. If a sensor, its wiring or connections have a problem, the check engine light will be triggered, even if it only happens occasionally. Q: Can you clear this up? I know someone who thinks Minnesota and other cold states have special-made cars for our weather and that warmer weather cars aren’t sold up here. A: Please let your friend know that this is not the case. If it were, cars bought in Florida would not run properly in Minnesota and vice-versa. Besides, could you imagine the cost of production for automakers and, ultimately, buyers? Bob Weber is a writer and mechanic who became an ASE-certified Master Automobile Technician in 1976. He maintains this status by seeking certification every five years. Weber’s work appears in professional trade magazines and other consumer publications. His writing also appears in automotive trade publications, Consumer Guide, and Consumers Digest. Send questions along with name and town to Motormouth, Rides, Chicago Tribune, 160 N. Stetson Ave., Fourth Floor, Chicago, Ill. 60601 or motormouth.tribune@gmail.com.